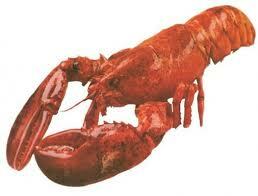 I learned how to eat lobster when I was five, on the dock of our rented house on one of the Belgrade Lakes in Maine. A weekend guest saw me struggling and took me aside. 1. My uncle, an executive in the music business, had seven or eight licensed lobster “pots” in Long Island Sound in front of his house in Old Greenwich, CT. When he thought there might be prizes in the pots, he’d row out and pull them up, tossing back any crustaceans that were undersized or not legal in other ways. I went along a few times and gained a new appreciation for commercial lobstermen–it’s a lot of work. 2. An inventive friend invited me and my young daughters to join her and her three girls for the day. She was planning lobster salad for a large crowd and had stored the crustaceans in her fridge. “We’re having a lobster race” she told the girls. She handed each kid a wooden spoon, drew a starting line and put the lobsters on it. We rooted for our favorites, the girls pushing their choices forward towards the finish line with their spoons, everyone roaring with laughter. It was great fun if you don’t count feeling a little like a Roman cheering for gladiators vs. lions. 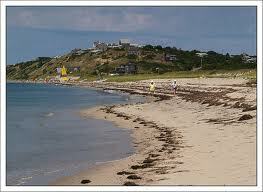 Corn Hill Beach, Truro, MA. Combine first 7 ingredients. Spoon 3/4 cup salad into each bun. There are a zillion places to eat lobster rolls all over Maine (and elsewhere in New England). Red’s Lobster Shack in Wiscasset is one of the best. When it opens for lunch, there’s a line and traffic stops. Get out those napkins! This entry was posted in Uncategorized and tagged lobster, Maine. Bookmark the permalink.